To develop an acceptance tester for DSL modem/routers that requires minimal operator assistance and reduces both test time and number of operators required. 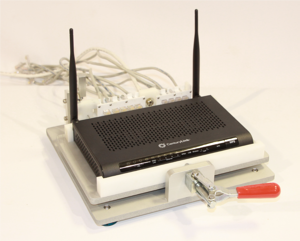 Ball Systems developed a test station capable of simultaneously asynchronously testing up to eight DSL modem/routers – testing full port functionality (WAN, Ethernet, DSL, HPNA, WiFi) and ensuring no visual defects and proper LED illumination. The system utilized interconnected PCs and the BallTest™ software platform using NI’s LabVIEW with XML scripted test sequences and an SQL database. 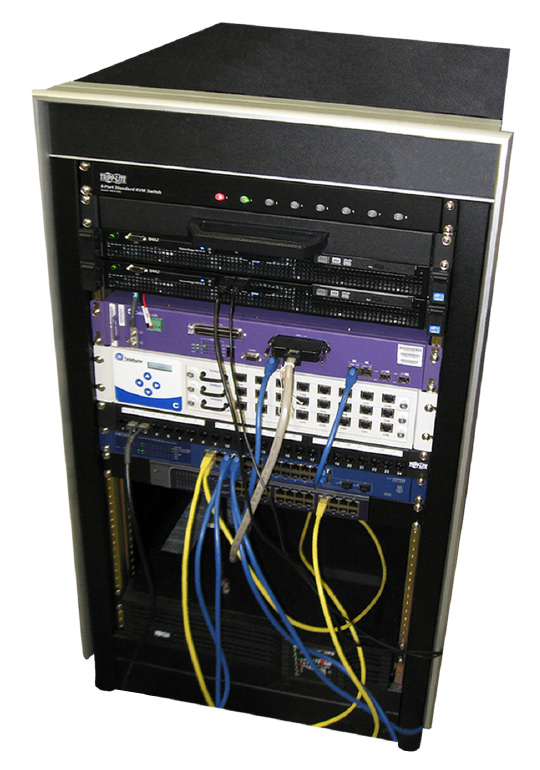 Server rack with DSLAM and Telebyte devices in order to simulate DSL data and line length, respectively. Server rack also houses a Windows Server and a Linux Server. DSLAM and Telebyte are used for a file transfer to validate the functionality of the DSL ports. Linux Server acts as the FTP server for this. One tester PC and one FTP PC. Quick-connect fixture inside the isolation chamber. Tester software is written entirely with LabVIEW and uses the BallTest™ platform with XML scripted test sequences. Selenium Web Automation add-on for LabVIEW to obtain modem information and to navigate through the modem’s support console. Tester PCs are connected to FTP PCs; a file transfer from the FTP machine to the tester machine and resulting throughput are used to verify WAN, Ethernet, and HPNA port functionality. Software dynamically creates a wireless profile for each modem being tested, and will attempt a connection to this newly created profile in order to validate the WiFi port of the modem. All testing data and results are stored in a SQL database on the Windows Server. Windows Server is accessible remotely, and is used to remotely access tester PCs with VNC for remote testing and debugging. User interface allows operator to enter visual inspection information and also to track test results and progress. 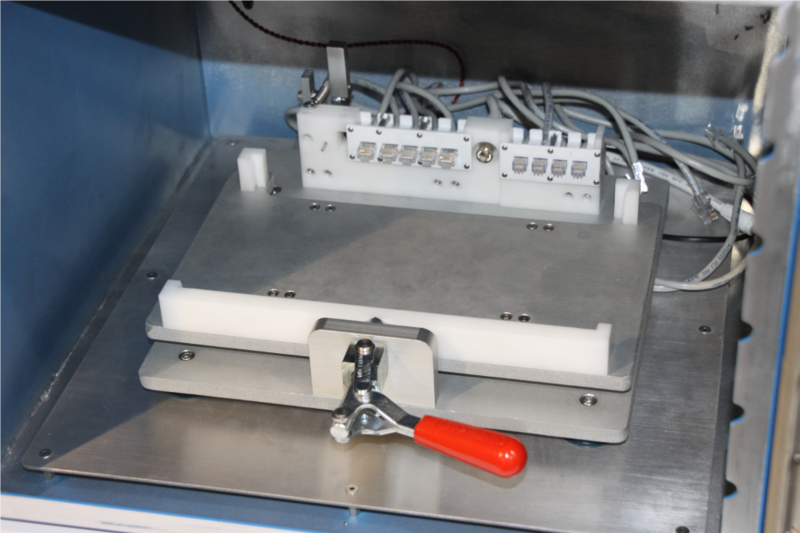 Quick connect fixture allows an operator to hook up a DSL modem immediately, saving test time and potential confusion from having to hook up wires individually. Bar code scanner and SQL database allow operator to immediately see if a model has a valid serial number, is in warranty and how many times the unit has been tested previously. 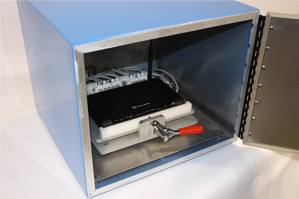 Isolation chamber improves testing consistency in a hostile environment where several other modem testers and wireless networks exist. SQL database allows customer to track test results, debug possible issues with the test setup, and also to tweak throughput limits. BallTest™ and XML test scripting allows customer to easily tweak throughput limits, timeout values, reorder test steps, add new test steps or modify existing test steps. Selenium Web Browser Automation toolkit for LabVIEW retrieves data such as hardware revision and firmware version automatically, eliminating the need for an operator to find this data manually. Remote access to Windows/Linux Server and the Tester PCs allow customer to easily debug issues when notified by operators. User interface is easy to use and has been tailored to the personnel using the software.